Japan’s Yuzuru Hanyu refreshed his personal best score in the free skate at the 2014-15 Grand Prix Final in Barcelona. At the beginning of the season, the 20-year-old had to pull out of Finlandia Trophy, his first international event of the season, due to a back injury. Then there was the warm-up collision prior to the free skate at Cup of China which forced him to rest for two weeks. Though he competed at NHK Trophy, he was not in top form and came in fourth. Nevertheless, he was able to qualify for the Grand Prix Final where he fought for and won his second consecutive title. “You climb over one wall only to find another,” Hanyu summarized, regarding his abnormal season thus far. In February, the three-time national champ then sprained his right ankle during practice and found himself off the ice for another two weeks. Due to the unexpected injury, Hanyu never made his way back to his training base in Toronto. Instead, he found himself training alone in Japan without his coaching team prior to the 2015 World Figure Skating Championships, which were to be held in Shanghai, China at the end of March. While the defending world champion insisted he had recovered physically and was feeling good about delivering a clean performance, the lack of systematic training eventually led to inconsistency on the jumps, especially the quads. As a result, he wasn’t able to defend his world title which was captured by Spain’s Javier Fernandez—his training mate from the Toronto Cricket Skating and Curling Club. 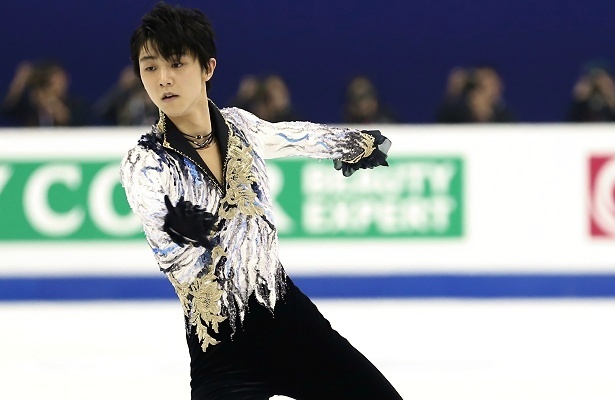 The frustration came not only because he lost the title, but also because he couldn’t deliver a clean performance of either the short or long program throughout the season. With this context, the skater from Sendai decided to participate in the World Team Trophy (WTT) held in Tokyo in mid-April. His aim was to finish the season strong by performing two clean programs, but unfortunately, things did not go as planned. Despite placing first in both segments, and therefore contributing to Team Japan’s bronze medal, Hanyu again expressed frustration. Still, the 2015 World silver medalist was still able to pull some positive out of the all the disappointments from the season. Indeed, the landing rate and grades of execution (GOE) on the quad Salchow did improve over the course of the season. After the World Team Trophy, Hanyu returned to his training base in Toronto and prepared the new programs for the upcoming season. In June, he returned to Japan and debuted part of his new long program in an ice show. To many people’s surprise, he selected a Japanese style piece of music from the movie soundtrack Onmyoji. In this program, portrays himself as the character Abe no Seimei—a Japanese esoteric cosmologist from the 10th century. However, instead of using a Japanese choreographer, he has chosen to continue to work with Shae-Lynn Bourne from Canada. The three-time Japanese champion also revealed that during the process, he and Shae-Lynn went through a lot of traditional Japanese dances and musical dramas together in order to select some of the moves for the program. They decided to add some of his trademark moves, including hydro-blading and the layback Ina Bauer, to the choreographic sequence. Although the Biellmann spin wasn’t performed at the ice show, he revealed that he was practicing it in training and plans on using it in the program. Aside from artistry, Hanyu also aims to further challenge himself technically by putting three quads in the long program, which was initially the plan for last season. He plans to open the performance with a quad Salchow, followed by a quad toe, and then put a quad toe combination jump in the second half of the program. To master this difficult layout with two types of quads (Salchow and toe) is the wall the reigning Olympic champion sees in front of him now. Hence the “wall” the Japanese skater feels he needs to climb. In addition to the quad Salchow and toeloop, he is also practicing quad loop now and keeps challenging it in ice shows these days. However, he has made it clear that he does not plan to incorporate it into his program at this time. However, it’s not lost on Hanyu that there are indeed other rivals that he will be contending with. One of which three-time world champion Patrick Chan of Canada, who we will go head-to-head with at 2015 Skate Canada in October in Lethbridge, AB, Can. Before the 2015-16 Grand Prix assignments were announced, Hanyu had already expressed his excitement towards Chan’s comeback. Hanyu also revealed that the experience of competing with Chan helps him stay focused.